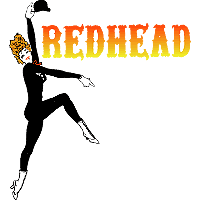 Redhead is a musical with music composed by Albert Hague and lyrics by Dorothy Fields, who with her brother, Herbert, along with Sidney Sheldon and David Shaw wrote the book/libretto. Set in London in the 1880s, around the time of Jack the Ripper, the musical is a murder mystery in the setting of a wax museum. Redhead opened on Broadway at the 46th Street Theatre (now the Richard Rodgers Theatre) on February 5, 1959, and closed on March 19, 1960, after 452 performances. Bob Fosse directed and choreographed. Production design was by Rouben Ter-Arutunian and lighting design was by Jean Rosenthal. The cast starred Verdon and Richard Kiley. The show won the Tony Award for Best Musical. The musical ran in a brief US tour after closing on Broadway, starring Verdon and Kiley. The tour started at the Shubert Theatre, Chicago in March 1960 and ended at the Curran Theatre, San Francisco, California, in June 1960. The Costa Mesa Playhouse in Costa Mesa, California known for mounting lesser-known, unique, and obscure musicals presented Redhead in June 1981. The musical revival group 42nd Street Moon in San Francisco, presented a staged concert of Redhead from September 2 to 20, 1998. The Goodspeed Opera House, Connecticut, presented the musical from September to December 1998. Directed by Christopher Ashley, the cast featured Valerie Wright as Essie, Timothy Warmen (Tom), Marilyn Cooper (Aunt Maude), and Carol Morley (Aunt Sarah). In late January and early February 2015, "Theatre West" in Hollywood, California presented benefit concert performances of Redhead, featuring Lee Meriweather (Catwoman the 1966 feature film Batman). This page was last edited on 16 March 2019, at 23:29 (UTC).